and a tv in my room. my clothes to be made in Hoi An. $15 for 5 1/2 hours. went here for afternoon high tea. buffet. I also had a massage here. Kinh Bac - 30 Dong Khoi. Another excellent meal in Saigon. 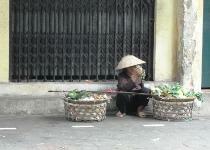 storm; how inexpensive everything was; the food in Hoi An; the tailors in Hoi An. 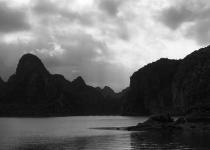 the Mekong Delta and Sapa. only wished I got to stay longer. Smells: Wonderful food; fish and other not-so-pleasant things at the market in Hoi An. Sounds: Motorbikes whizzing by; the 'toot toots' of the motorbikes; thunder. Hoi An patisserie; toasted baguettes with a shrimp mousse with a mango coconut curry sauce. ($35); some lacquerware; a vegetable shredder. hot stone massage at a spa. Street Food: Banana beignets; pho; fruit; banhs. Western Companies Out Here: KFC. Visa needed? Yes. It is necessary to get this before arriving. things do get a bit more expensive in Saigon. 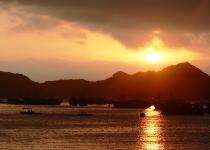 The sun setting on Halong Bay. A woman on the street.